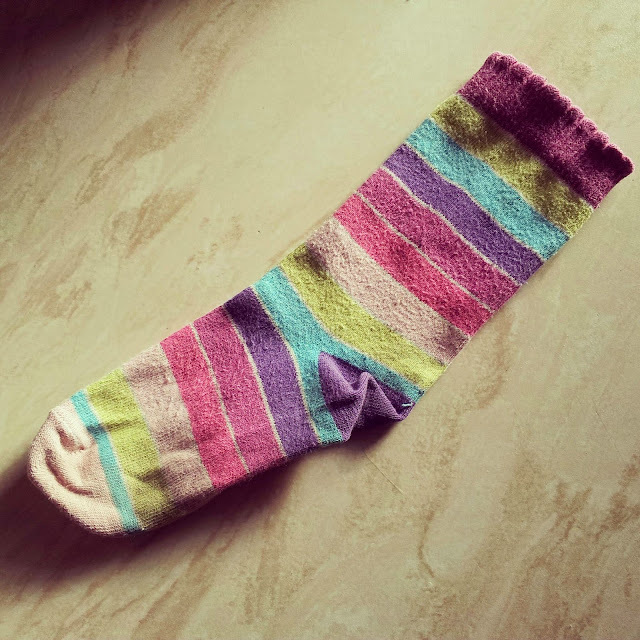 Monday brought a bit of a surprise for M. She pulled a sock onto her foot, only to have her big toe go through the end. A new experience for M, because it is only recently that her growth rate has slowed enough that she is giving clothing a chance to wear out before it needs to be retired because it is too small. M stared at her toe for a moment before asking me what we should do. I hesitated for only a moment before telling her to throw the holey sock away and we would make the other sock into a toy. I received a booklet about making sock creatures for Christmas and this seemed the perfect opportunity to have a go. Today, after a discussion with M, we settled on making a caterpillar, which while rated as a medium difficulty project in the book, seemed straight forward enough. We read the instructions together and M studied the photographs, then we gathered our materials and began. M is an experienced stuffer of home made toys, so took charge of that side of things, only needing the occasional reminder to pull the fluff apart and not to roll it into a tight ball unless she wanted a lumpy caterpillar. M stuffed the sock's toe and when it was full to our satisfaction, I tied it off with some yarn, forming a ball. We repeated the process along the length of the sock, until we had a 'lumpy sock' as M called it. I cut the cuff, braiding in antennae whilst M held the caterpillar still to stop it from wriggling away. M then spent a happy hour delving in my button tin before emerging with the perfect eyes. And here is Leaf Poppy, the caterpillar. Introducing Leaf Poppy the caterpillar. 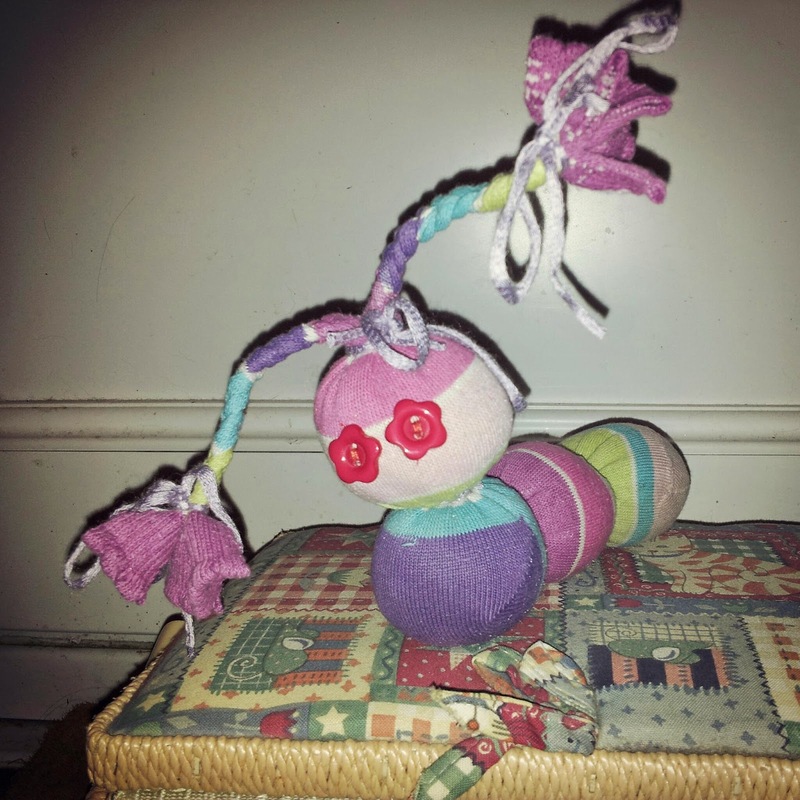 I have offered to sew pompoms on as feet, but M said she couldn't wait to claim Leaf as her own, which she has done, involving the caterpillar in all activities this afternoon. A successful project for both of us I think.